There is no reason to think that white cabinets make the kitchen look austere. White cabinets enhance the beauty and aesthetic appeal of your kitchen interiors, improving the overall look of the space. White cabinets blend perfectly with distinctive background themes and colors, creating a vibrant kitchen interior. Modern life can be full of stress and anxiety. Therefore, finding tranquility and peace in your cozy kitchen space can be very important and rewarding. Modern white cabinets bring this sense of peace and tranquility into your kitchen, which is the center of activity of your entire house. There are numerous ways in which you can decorate your white cabinetry, making use of innovative designs, multiple colors and contrasts, and various materials. Therefore these cabinets will be a perfect addition to your dream home. You can exhibit your creativity by redecorating your kitchen in a way that synchronizes beautifully with the white cabinetry. Here are some trendy and classic ideas to beautify your kitchen with these fashionable white cabinets. A striking and contemporary look is achieved by making a clever balance of light and dark colors in the interior decoration of your home. If you want this look in your kitchen, then install classic white cabinets and contrast them with bold-colored counters. Modern white cabinets give a stylish look to your kitchen, while the dark-colored countertops provide a striking contrast, that will beautifully complement the overall kitchen design. When these white cabinets will be combined with a black kitchen counter, you will have a super sleek and glamorous kitchen. Get yourself exquisite and remarkable kitchen interiors with this minor upgrade. Whether you incorporate granite, travertine, or dark wood countertops, you will cherish the beautiful color contrast whenever you walk into your kitchen. 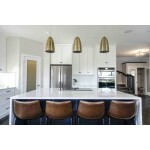 Modern white kitchen cabinets are sleek and elegant and make for a great addition to a modern kitchen. Providing a touch of sophistication, this type of cabinetry can be incorporated to minimize the cluttered look of a kitchen. A unique design can be created by pairing these cabinets with a statement backsplash. These are generally used above the stove, to accentuate the kitchen space. For a spectacular view in your kitchen space, go bold with a patterned backsplash made of a multi-colored tiles or mosaic. Even warm toned backsplashes, like sunny yellow, or orange will blend well with your white cabinets. It will brighten your mood, as well as incorporating a captivating texture in the kitchen. Sparkling white cabinets combined with a rustic, wooden design will create a warm and tranquil interior space. The glossy finish of these cabinets offers great smoothness, and gives an exquisite sheen to your kitchen. 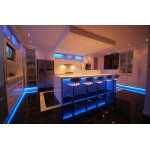 Your kitchen will have a clean and immaculate look always. The rustic wooden countertop, paired with white cabinets is a perfect way to include natural, earthy tones and elements. When this natural material is used as a countertop, and paired with the lustrous white cabinets, a comfortable and welcoming vibe is created in your kitchen. This soothing ambiance can improve the quality of your life at home. You can even think about incorporating wooden flooring that will work well with the overall look. It will lend a classic and timeless look to your kitchen décor. Bright white cabinets give a touch of elegance to your culinary space. Combining these white cabinets with beautiful and vibrant colors can add loads of personality to your kitchen. Introduce colors in a strategic way, like painting the door frame with warm orange, adding a rainbow colored accent, or including orange lights. Moreover, you can place vibrant red or blue chairs around a light-colored kitchen island, or hang beautiful and colorful pictures on your kitchen wall. It will also help to improve your mood whenever you feel down. The beauty of the modern white cabinets can be accentuated when these are contrasted with black and gray hardware. Matte black hardware is trending right now and it lends a classic look to your white cabinets. Together, they provide depth and character to your kitchen, that attract the eye of any visitors or guests. If you want to add a hint of color in your kitchen, then you can paint the insides of the soothing white cabinets with a bright and vibrant color. When the cabinet front, shelves, and panels are all white, adding colors like turquoise to the interiors of the cabinet can truly provide a distinctive look to the cabinets. 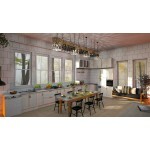 Moreover, you can replace the cabinet doors with glass panels to make the colored interiors more noticeable. This will lend a unique look to your kitchen, that you will love to flaunt always. Stainless steel kitchen appliances have gained great popularity in recent years. If you yearn for a wonderfully sleek, ultra modern white kitchen, then combine white cabinetry with stainless steel appliances. Keeping the walls white will help enhance the brightness of the kitchen as white walls can better reflect the rays of the sun. 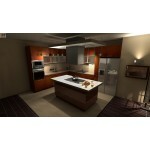 This will give a spacious feel to your kitchen space, making it look larger and more welcoming. Stainless steel appliances can make any kitchen look more modern. Moreover, these appliances are more durable and long-lasting. Using some of these ideas will certainly help you improve the aesthetics of your kitchen to a great extent. Implement one or a few of these tips and see the transformation in your kitchen, which you will surely love.